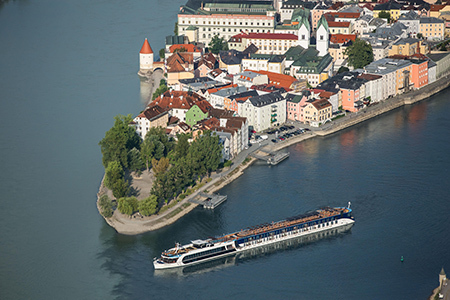 Family-owned and operated, AmaWaterways is known for its award-winning river cruise ships, exquisite cuisine, authentic experiences, and above all else, its unparalleled service. Whether you journey through Europe, Southeast Asia or Africa, the extraordinary crew turns every mile you travel into your most cherished memory. You’ll also enjoy innovations that include view-enhancing twin balconies, active hiking and biking excursions, invigorating wellness activities and a multi-course tasting menu at The Chef’s Table specialty restaurant. AmaWaterways is honored to welcome multi-generational families on board, offering connecting staterooms and triple and quadruple accommodations on select ships. 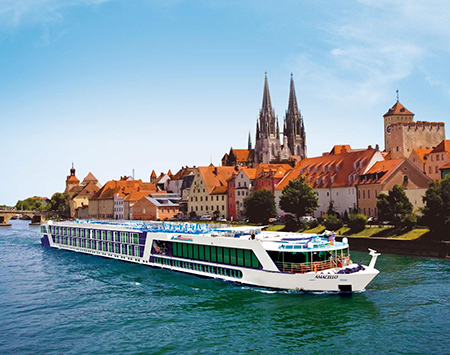 In May 2019, AmaWaterways will proudly introduce their new AmaMagna on the Danube River. A ship twice as wide as traditional river ships, AmaMagna features more than 50% suite accommodations measuring from 355-710 square feet, as well as five bars, four unique dining venues, two soothing massage rooms in its expansive Zen Wellness Studio and a groundbreaking Water Sports Platform that offers intimate Sundowner boat excursions. Traveling along the Danube and discovering Vienna and Budapest’s dazzling glamour. Or sailing along the Seine and falling in love with the romance of Paris. Be charmed with the scenic Main River and Bavaria’s endless cobblestone streets and half-timbered homes. Explore the richness of Southeast Asia’s Mekong River, or discover Africa’s Chobe River on a wildlife cruise and safari experience. Whatever vacation you’re dreaming of, AmaWaterways will take you there in style – aboard the highest-rated ships in Europe according to premier travel authority Berlitz. In every port, guests can choose from a selection of included city tours as well as Limited Edition Tours, which encourage further immersion into the local culture. Indulge in authentic Belgian waffles and chocolate making in Antwerp or learn how to cook French cuisine in Provence. For guests seeking a more active approach, AmaWaterways has expanded their award-winning guided biking and hiking tours. Wine Cruises provide in-depth epicurean dimensions to standard itineraries—at no additional costs. Uncork local traditions while exploring stunning wine regions like Bordeaux, the Wachau Valley and South Africa’s Cape Winelands. You’ll be greeted by wine experts offering lectures, excursions to historic vineyards, curated wine tastings and, of course, award-winning cuisine paired with perfectly chosen vintages. AmaWaterways created the concept of twin-balcony staterooms. With both a French and outside balcony, such spacious accommodations offer panoramic views in the privacy of your stateroom. Indulge with a soothing massage, exercise in the complimentary fitness room, discover special souvenirs in the curated gift shop and visit the onboard hair stylist. The heated pool comes with a swim-up bar atop the sun deck. AmaWaterways is the only river cruise line invited to be a member of La Chaîne des Rôtisseurs—an exclusive and prestigious international culinary society. Expert chefs prepare, locally-inspired cuisine – ensuring an authentically delicious experience. It is also the only river cruise line to offer The Chef’s Table—an intimate specialty restaurant where a lavish dinner is prepared in front of you. 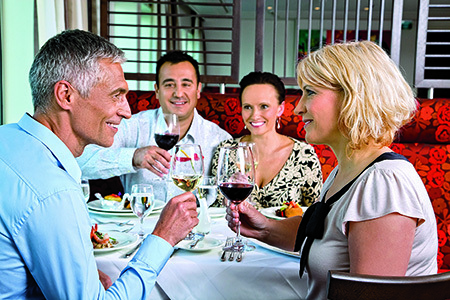 All onboard dining, as well as unlimited premium wine and beer with lunch and dinner, is included with your cruise. 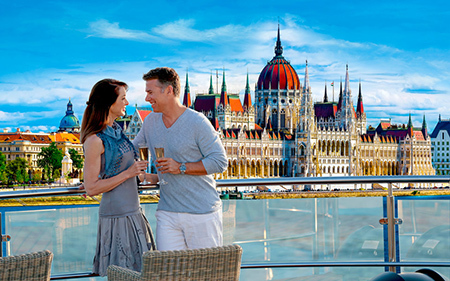 With a variety of dining options, shore excursions and onboard amenities, you will always have the luxury of choice – and the luxury of an unforgettable river cruise with AmaWaterways. twin-balconies, connecting doors and triple accommodations for family travel. 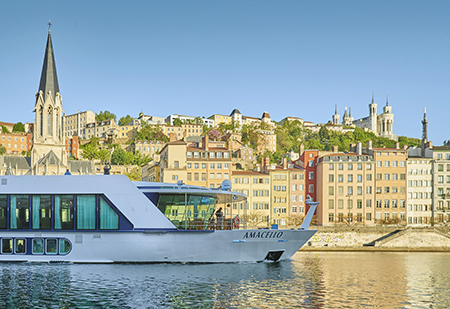 AmaWaterways will continue to innovate with the state-of-the-art AmaMagna, the largest river cruise ship in Europe. With a high staff-to-guest ratio on our ships, our team is fully dedicated to providing each guest with the highest level of genuine service with a smile. AmaWaterways’ Cruise Managers have extensive experience in providing exceptional levels of professional and personalized service. They are there for you every step of the way, both on board and during your pre and post-cruise land program. 210 – 235 sq. ft. and suites from 300 – 350 sq. ft.
All staterooms offer a flat screen monitor featuring movies, news, TV and music. In-room internet access and ship-wide Wi-Fi are also complimentary. Unwind with a soothing massage. Get your hair styled. Stay active in our fitness room. Take a dip in our sun deck pool with a swim-up bar. These are just a few of the many ways to relax and indulge on board. We craft exquisite, locally-inspired menus as well as traditional Western offerings. Breakfast is a lavish buffet with fresh pastries, as well as madeto- order menu options. The Main Lounge serves a light lunch, while the Main Restaurant offers a full menu service. Dinner is a multi-course affair with wine recommendations. Lunch and dinner offer unlimited fine red and white wines, with new selections daily. Beer and soft drinks are also available during these meals, and sparkling wine and fresh juices are served during breakfast. Gourmet coffee and tea station available 24 hours a day. New for 2018 - Sip & Sail daily cocktail hour with complimentary wine, beer & spirits. 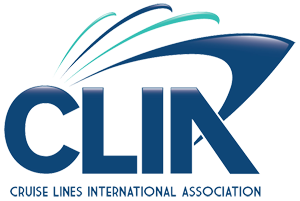 AmaWaterways is inducted into La Chaîne des Rôtisseurs™, a prestigious international culinary society dedicated to fine cuisine. * Membership is by invitation only to those possessing world-class culinary acumen. guides. We also offer tours for gentle, regular and active walkers. There is even an option for later risers. These included excursions provide immersive opportunities to experience local culture in a unique way, and are offered in addition to standard city tours at no extra cost. We accommodate a range of dietary restrictions and offer gluten-free as well as vegetarian items. Our fish is always fresh and the ship also features daily mineral waters infused with fresh fruit and herbs. fitness for the mind, body and soul. Select sailings in 2018; All European sailings in 2019 (excluding Portugal).